Ours is the path of honor and truth, a path of light, and seldom darkness. We came from the far away land of Monty, and traversed the terrible desert of Python to arrive in the world of Godville. Our mission is to proclaim the sacred words "Ni, Peng and Neee-wom", to collect shrubberies, and to learn to wield the mighty herring. As one of the largest and most wealthy guilds in Godville, our members are treated with nothing but the best. 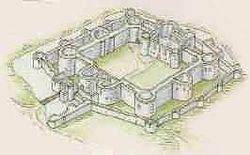 Our guild hall is the most impressive building in the realm, and is equipped with a state of the art training center, although this is sometimes called the maze of death, the palace of pain, and that-place-where-we-keep-hearing-screams-from. The personalized hospital and the many lounges and areas of relaxation are the envy of many a hero. Yet of all these things our most notable is the magical table of the Knights who formerly owned a Square Table. This artifact has the rare power to create any food or beverage at will, simply by sitting down and wishing for your meal. Many heroes have been known to join simply for the never ending flow of beer that is available from this wondrous table. All other guilds beware, as any attempt to 'liberate' our table will result in the awesome power of "Ekke Ekke Ekke Ekke Ptang Zoo Boing Zow Zing!" No hero has ever been known to receive these words of power and live to tell the tale. 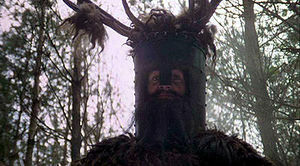 If you wish to join the ranks of Ni-Sayers you must bring a shrubbery of suitable size to our guild leader, Harbinger of War . Be warned, failing to bring a large enough shrubbery will result in a slap of the herring and an order to repeat the quest. However you should also be aware that succeeding to join our guild will also earn you similar treatment in the form of the herring slap of entry. To convince your hero to join the ranks of the Ni-Sayers you must send this command to your hero. For largest chance of success, send the command while your hero is "'outside of town"' and is idling. (i.e. not fighting a monster) If the above does not succeed after several tries, try replacing the word "join" with the word "enroll". Shannonus : The Saintliest of Smoters, Wielder of Benevolent Power, Champion of the Light, Defender of the Sun. Nuanen : The "nice/sweet" one, former Leader of 2yrs and the perfect model of Good! BlueStapler : Guide to all-that-is-shrubby. Trentos : Keeper of Knowledge, Holder of all that is Sacred. No trolling. This would include obscene or rude comments. Keep foul language at a minimum. Remember, you may be one age but this is a site in which all ages play and so keep that in mind that there could be young children reading your comments. Keep Diary Entries At Minimum. A diary entry here and there is fun, such as a duel win or a brick melt but no one likes 8 posts in a row of random Diary Posts. Be helpful! If you see someone with a question, answer Ni! Or if you don't know Ni and know that someone else does, get their attention! Have Fun! As always this is thrown in, remember Ni's a game and if games weren't meant to be fun no one would play them. Our glorious guild has recently made peace with the evil but powerful guild that is Harvest Moon. After a long bloody war we have learned to respect each other for who we are and we have stopped trying to convert them to the bright side. After all without evil and darkness there cannot be good and pure light! We are also currently involved in conversations with the Breadsticks guild. Despite having a banana obsession, they seem to be a pleasant bunch, and very respectful. A word of note: They seem to have developed the strange idea that we must use the word Ni in every post, and are even awarding themselves cookies when we fail to do so. We had a quiet war with Wiki Leagues, as we felt they were a foolish guild and would surely be assassinated by government agents if we didn't discourage their ways. We shouted Ni at them until they slowly crumbled to dust. We allied with Warped Quantum as was the wish of their great leader Spode who technically owns this page and every other page on the wiki (sort of). Our buddies over at Sowing Sun frequently mingle with our members in chat rooms and on the forums...and we kinda like that. So we mingle right back as much as possible. They're such a wonderful bunch of people that imagining life in Godville without them is very hard. Speaking of Godville... Godville's Regiment have been our ally for some time and until now hadn't received a mention here...shame on us! They're still happy to have us around though. As Knights of Ni, Ni is our duty to prove ourselves throughout the arena. To demonstrate, the power that each one of us holds. To show, to the rest of the guilds! What we are truly made of! For we are not your everyday opponent, no we are much worse. We are Knights. Every knight is expected to follow a set of rules when finding themselves in either the arena, or in a skirmish. Use of VCs: The use of VCs (Voice commands) should contain either Ni, or a use of the word Knight. Ex. "Heal your wounds my Knight of Ni" "Heal your wounds champion! NI!" This is to distinguish ourselves from other guilds. Use of punishments: Contrary to popular belief, we are not a guild who makes strict rules concerning the use of punishments, although being good aligned is encouraged, punishment is a useful tool in the arena and is expected to be used during a sticky situation. Language: No foul language/Putting down your opponent through VCs. Anger should never be expressed towards an opponent during a battle. If you have a score to settle with someone you should either settle Ni through a PM or challenging the opposed to a duel. Avoiding matching a fellow Knight: Arena usage between members is controlled by posting opening and closing statuses in the Guild Council as listed below. A member posting an opening status must follow Ni up with a closing status once they're matched or match failure occurs. A special circumstance exists whereby two members may send their hero/heroine to the arena simultaneously if their levels are far enough apart from one another. For now, these level brackets that members should avoid can be found here on the GodWiki. Statuses below are in bold for clarification. Opening Status (Traditional way): Before you go to arena, post your level and "in": E.g. (40 in). Any member wanting to send their hero/heroine to the arena before a closing status is posted can do so as long as they're outside the level bracket of the member with the open status. Opening Status (New way): Before you go into the arena, post your temple status (no temple/temple) and "in": E.g (Temple in). Any member wanting to send their hero/heroine to the arena before a closing status is posted can do so as long as they're of the opposite temple status from the first opening status. Closing Status A: As soon as you're matched with an opponent, post matched. Ni is now safe for other members within the level bracket of the first member to post their opening status. Closing Status B: On occasion there may not be a viable opponent for you in the arena. You will be notified when this happens. At this point you must immediately post no match. Anyone can now post an opening status as long as they're outside the level bracket of any other members with an existing open status. Forfeit the match. This applies only to the second member into the match who failed to see the existing open status of the first member. This is a courtesy that ALL knights acknowledge. Or fight like you would anyone else. In this case you're expected to send a "good job" message either through PM or on the forum to the matched member. Fighting a paying player without paying yourself: Perhaps what makes most people give up on the arena is not paying for charges but going up against a paying player. Knights should never, never give up. Never! Use the three charges you can accumulate to bash the opponent into submission. However, Ni is highly highly unlikely you will win against a paying player with only three charges. If you are frustrated you may PM Nuanen and she will provide you with a guide for the arena. And possibly the most important, have fun. All distinguished and long-standing members will be recognized here. B0x is known best for his role as the guild's official weapons depot. He holds anything from every day firearms to tanks or even medeival contraptions. He is even more then willing to take special orders as well. Not only this but he is also one of the original KWSN cheerleaders! A little known fact about Bobkin is that not only is he a great and powerful Knight in all other Ni aspects, he is also the Great Pool Shark of all Godville! Whether you meet him in the arena or in a tavern, you will be smart to protect yourself from his amazing abilities. Jewelz : One of the highest ranked active KWSN, known as "Our lady Prophet of Ni". Jewelz can often be found in the great hall, making herring snacks and preparing tea. Anyone who stops by the guild should take a tour of her beautiful garden. Just beware if she happens to be busy in her work shop. Despite her lovely appearance she can be quite the mad scientist. Some would say that this Knight has a certain 'magical' quality to her. Others would ask who in Godville she is. Believing she must constantly work towards the greater good, she seldom appears in the GC or the forums. But as long as you remember her, you are not alone. One of the strangest members of the guild, Necro has shown that he can be just as random or goofy as any fool. So Ni is fitting he be the guild jester. His jester staff is capable of making anyone collapse and burst into laughter. Even at the stalest of jokes. To which he has no shortage of. Virus Ex : That Weird German Guy. Virus is a rather unpredictable member. He seems to always find something to do even at the most dull of moments. That very attribute seems to have made him a favorite with the knights. Insistent on being called That Weird German Guy, virus is just that. The following Knights are patiently sitting in the Great Hall's waiting room discussing creative uses for the herring while the powers that be write nice things about them to publish here. Sembazuru : Divine Miracle Giver. Behold! The 260 temple owners of our great guild and the dates they achieved this amazing feat! No doubt that they have worked hard to get to where they stand today. May we all some day be so lucky. 68% of KWSN guild members own temples! All active members of the guild ranked cardinal and above will be noted here. If you feel that your name should be here, please contact one of the Guild Officers. Former leaders and officers are acknowledged here. Coldwilson : Founder of the Ni nation keeper of the sacred word, and father of all the Knights Who Say Ni! Zarquon : Original leader and warrior of the sacred word! Mortalin : The Black knight that kept the guild together, to ensure the success that Ni has today. Without these past Leaders of Ni we would not be what we are today. We owe our current assembly and estate to their efforts and blood. A place where we acknowledge former distinguished members who've become inactive. Please come back, we miss you! Camelon is the "mother" of our guild, or the "Wendy" to our lost boys if you will. She leads by example of how to show complete loyalty and gratitude to one's guild by her consistency in stating Ni!, showing encouragement in all towns to increase our unity, and never allowing her hero to stray from the guild even when he tried. Named after the Scottish town of her origins, her mission is to prove that Ni is possible to be kind, righteous, or good and still be a powerful gladiator...shy by nature she is often underestimated by her arena opponent allowing her (some say) to "bewitch" them just long enough to make a deadly kill. Jorge52 had a very important job, indeed some members believed he had the most important job of all. Beware, his fuchsia coloured drink with a special ingredient is an absolute bender. Steer clear of that or at least make certain you are prepared for the ensuing chaos. Lord Bored sadly became inactive for unknown reasons and has drifted from the guild. Wherever he is, we hope he's well. His enormous wooden carving of a herring (which he carved with a herring), still stands in the Great Hall. Many do not even know what a library is, but this did not bother Mizu. Her vast knowledge on past, present, and future has saved many a knight in their unguided travels. Watch out, because not all of her books are friendly. Sometimes referred to as "Mad", Phi tended the guild laboratory. And while no one other than her has ever been to the lab, Ni was assumed she used her many skills for all that is good and shrubby. The lab is still off grounds to all other knights as we still don't know what dangers lie within. Where has he gone? No body knows? One thing is for sure, he doesn't appear to be anywhere, not here, nor there... or anywhere! Suzan tried hard to ensure that every new member was up to date on their entry tasks. Making Sure the proper shrubbery was checked and recorded. Despite one incident with strange, metal birds, she has most definitely made a name for herself. A knight may leave our great guild to further their career and expand their résumé or just have a little vacation. We make mention of them here and hope that one day our travelling knights will rejoin our ranks. Though she has travelled far and wide, home to Epona is KWSN. No matter where she goes she always returns to us. She can be found frequently in the guild council where she keeps the knights entertained with her funny antics and witty sense of humour. She is always willing to lend an ear to a friend or advice to a new guild mate. This Knight prefers to live his life in the guild's shadow. He has travelled much in the land of Godville before finally settling down in the great hall of Ni where he hopes to retire one day. Though he makes few appearances in the guild council he keeps a vigilant watch over is hero, DNV. D-Envy is currently spending time with our allies Harvest moon. Fishcakes : Our Eldest and highest ranked Knight of Ni!. Although we do not see to much of Fishcakes, she sometimes comes out of her meditation retirement to bestow us with help and knowledge. She is our most reverent and highly regarded Knight! Fishcakes is currently spending time with the folks at Animal House. Guild Spotlight, Edition #2975, Day 3219 g.e. Knights who say Ni is a group of 286 brave adventurers, who have climbed to 8th position in the pantheon of duelery. Veterans in this guild call themselves “elderni”. All time favorite of this guild is Knight Who Says Ni. If this guild were a settlement, then Monstro City would be its sister town. We say goodbye to knights who held a special place in our great guild. Passed was a loyal Knight for many months, and became Second in Command when Coldwilson left the guild. He was very active on the forums especially when Zarquon and he had to restore the guild and was responsible for assigning chores and difficult quests to worthy Knights. His many tasks and responsibilities caused him to pass on the mantle of leadership to Sensei. We still hope that one day he may return to our halls.